CocktailMom: Mini Scrapbook Album GIVEAWAY!!! A dear friend's birthday inspired me to dig through my scrapbook collection and create a mini album of random bits of goodness. I decided to also offer one to one of my lucky readers!! 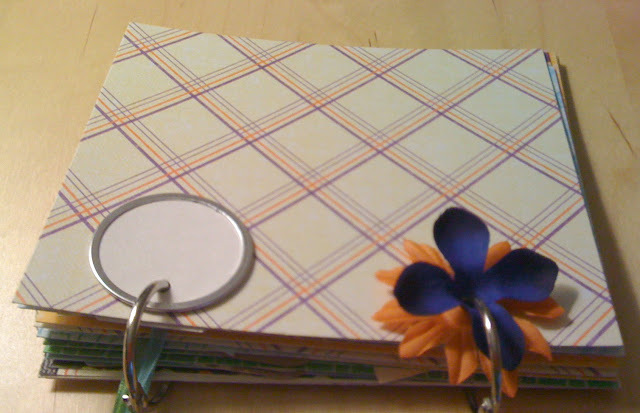 Here is your chance to WIN a MINI scrapbook!!! 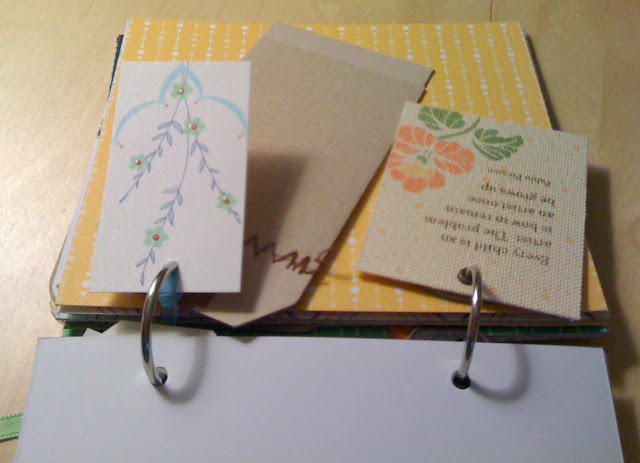 The mini album is full of scrapbook paper, card stock, tags, embellishments, and quotes. Use it as-is and fill with pictures or take it apart and use elements of it for card marking or your layouts. Just answer this question in the comment section of the blog "What brings you JOY?" I love crafts and creating something out of bits & pieces but what really brings me joy is sharing with someone and knowing I have really helped in a time of need. family, friends, fun... fresh rolls baking in the oven, saturday mornings... moments when my kids aren't fighting... kind words of encouragement... alone time.. creating.. dancing... all of those bring me joy. Thursday night crafting with my bestest girls in the world! And my kids! Ha, Dani, you took the comment right from me. I'll have to say then, learning new crafting skills from the wonderful Thursday crafty ladies. Like crocheting or raw edge applique. What brings me joy... seing my girls being mothers to my grandchildren...seing smiles on my grandchildren when they do some great. Like reading, singing, and running. Knowing all I have to do is put my arms out and the grandchildren will give Grammy a hug and kiss. Thank you all for posting comments. I drew a number and WENDI you are the winner! Congrats! I'll be doing giveaways again on the blog so keep checking back!